For whatever reason, we have been obsessed with breakfast lately. Where granola bars or a packet of oatmeal used to suffice without a second thought, we’ve been making full breakfasts of eggs, bacon and breakfast breads. Real breakfast, almost as if every weekend morning was a celebration of surviving another week. 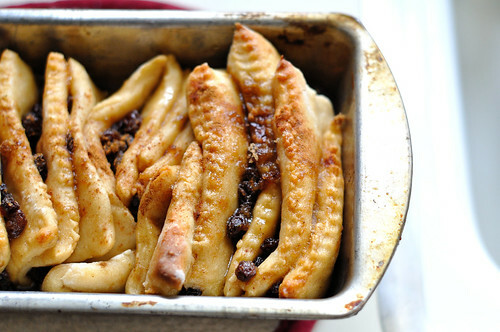 And as I’m ever-inspired by Joy the Baker, I’ve been wanting to try my hand at cinnamon pull-apart bread for months. I don’t know why I’m still waiting months to try recipes. Despite feeling more comfortable with breads I still build them up in my mind as some kind of event. This recipe is as simple as making a batch of your favorite sweet dough, lining it with a filling, cutting it into pieces and lining a loaf pan and baking. I have two favorite sweet dough recipes: one that involves lots of butter, and one that has none at all. I just happened to have no butter left and tons of applesauce, so the choice this round was pretty well made for me. Really though, there isn’t a whole lot of difference. 1. In a small saucepan, gently warm 3/4 cup non-dairy milk to about 110 degrees. Sprinkle yeast over warmed non-dairy milk and let it dissolve, about 5 minutes. 2. 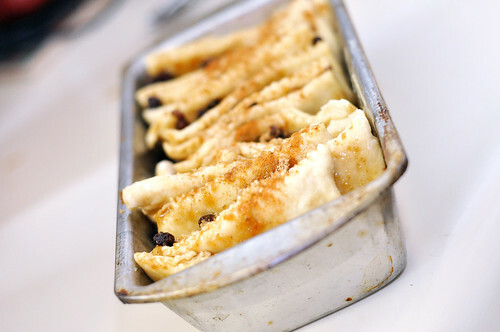 In a large mixing bowl, combine 2 cups of flour, 1/4 cup sugar, baking powder, cinnamon and 1/4 salt in a large bowl. 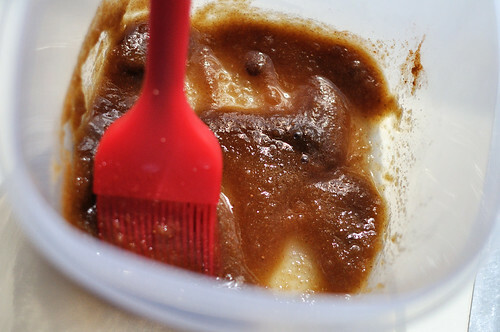 Add 5 tbsp applesauce and yeast mixture, stir to combine. Add in another 1/2 cup flour, stirring to combine. 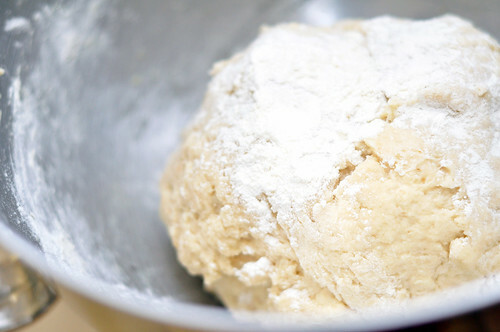 Continue mixing until you have a sticky dough ball. 3. Place the dough is a large, oiled bowl (or drizzle a little oil in your current bowl and roll the dough in it. Cover with plastic wrap and/or a kitchen towel. Place in a warm space and allow to rest until doubled in size, about 1 hour. Once risen, you can refrigerate overnight to use in the morning, just allow to rest for 30 minutes on the counter before rolling out. 4. 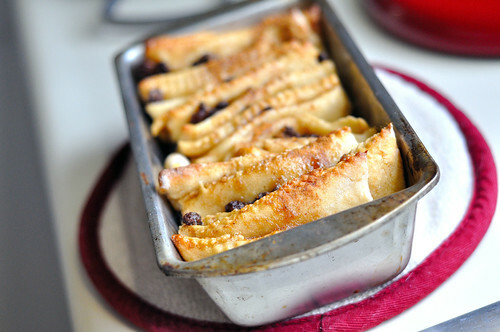 While the dough rises, whisk together the brown sugar, cinnamon and applesauce for the filling. Grease and flour a 9×5×3-inch loaf pan. Set both aside. 5. 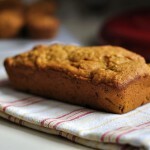 Sprinkle remaining flour on a flat surface and knead dough, kneading in most of the flour. Using a floured rolling pin, roll dough into a large thin rectangle, about 12-inches tall and 20-inches long, or roughly as large as you can make it. 6. Using a pastry brush, spread the filling across all the dough. Sprinkle with additional brown sugar if desired. 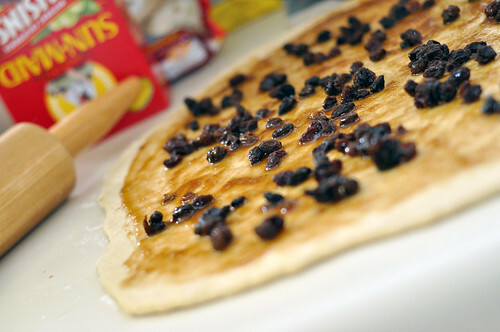 Sprinkle raisins evenly across the dough. 7. 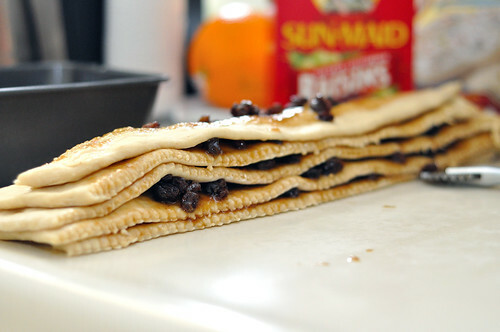 Slice the dough vertically into strips and stack strips on top of one another and slice into strips again. The strips will measure around 3 1/2-inches on each side. 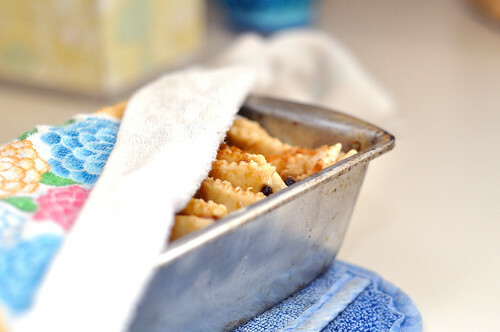 Layer into your greased loaf pan and cover with a kitchen towel and allow to rise for 30-45 additional minutes. 8. Meanwhile, place a rack in the center of the oven and preheat to 350 degrees F. Bake for 30 to 45 minutes until tips are deeply golden brown. 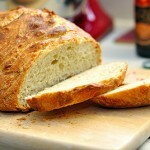 The center takes much longer to cook, so deeply golden tips will be indicative the entire loaf is cooked through. 9. 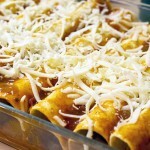 Allow to cool for up to 30 minutes before removing from pan and onto a clean surface or serving dish. Drizzle with glaze topping if desired. Yum. Yum. Yum. 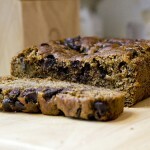 We burnt our tongues with our inability to wait for it to cool, and finished most of the loaf in the first two hours. We’re terrible, but this bread is amazing, and would make an awesome conversation piece at any brunch or event. Our loaf was loosely packed, so if you want yours to be packed tightly, with tiny thin slices, make an additional half batch of dough and filling. Our oven is currently broken, and this recipe isn’t making it easier to wait for it to be fixed. Can’t wait to try this! 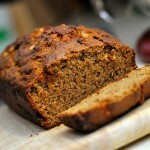 mmm, i just made the non vegan version of this, but this vegan version looks fantastic!! i build baking bread up in my head as an event, too. probably because it’s so time consuming!! 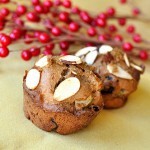 @Chrissy – It was so easy, I can’t believe I hadn’t made them before. @Katie – It definitely is time consuming. I’m trying to get to the point where I just throw a loaf together before work and let it do all the work itself while I’m busy doing other things.